Every year BC Business award’s the province’s twenty most innovative enterprises. I wrote a profile for SFU’s Aboriginal EMBA at the Beedie School of Business and GoVoluntouring Ltd., a volunteer tourism company. Congratulations to SFU’s Beedie School of Business, 2013’s #10 Most Innovative Company in B.C. B.C.’s aboriginal business community has a big stake in the province’s economic future. Treaty agreements, renewed autonomy over aboriginal land and increased control over health and social services have been game-changers for bands and First Nations across B.C. But future opportunities are still tied to present challenges, and big questions. Can business priorities reconcile with indigenous world views? And how can aboriginal business overcome the financial limitations and economic disadvantages embedded in the Indian Act and inherited from a history of colonization? The Executive MBA in Aboriginal Business and Leadership at SFU’s Beedie School of Business is tackling these challenges head on. Launched last September, the program attracted business leaders, administrators and senior officials as students, including Squamish Nation Chief Ian Campbell, and former mayor of West Vancouver, Pam Goldsmith-Jones. Semesters are divided into tight, two-week sessions at SFU’s downtown campus, allowing the participants to ferry between the Lower Mainland and their full-time jobs, with some participants travelling from as far away as the Yukon. According to program director Mark Selman, 80 per cent of the content is the same as the regular EMBA. The difference? Addressing the role of indigenous knowledge in the boardroom, and the accounting for unique policy and governance issues that aboriginal enterprises face. “We look at standard business models like Apple, but we get to a point where that won’t work in our communities, so then we have to make it applicable within our world,” explains Tamara Goddard, a student in the program’s inaugural semester and the founder and CEO of Blue Habitats Distribution Ltd., a manufacturer of eco-friendly building supplies. Six months in, the program is a pilot for First Nations professional training, and has provoked conversations about aboriginal commerce and economic development. Teck Resources Ltd., a financial supporter of the program along with Vancity, started hiring students two months in. Selman says other Canadian universities are interested in developing a similar program. Congratulations to GoVoluntouring, 2013’s #17 Most Innovative Company in B.C. 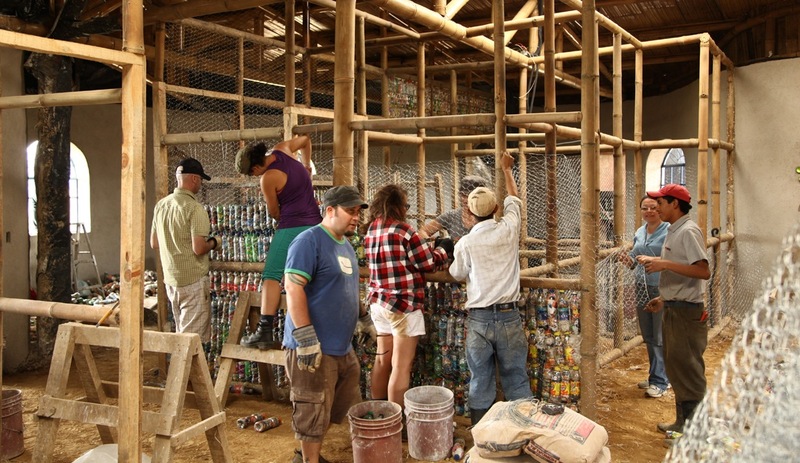 A project in Costa Rica where volunteers build structures using eco-bricks, building materials made of plastic recyclables. Dubious middlemen. Shady lodgings. A disputable impact on the community you hope to help. Volunteering abroad isn’t very promising at first glance. But with 2.5 million volunteers embarking annually and spending an average $3,000 per trip, GoVoluntouring Ltd. saw an opportunity to set standards, vet organizations and connect tourists to projects suited to their needs and expectations. The volunteer travel website connects consumers to a database of almost 4,000 vetted vacations around the globe. It matches prospective do-gooders with packages according to interests, age, fitness level and professional background and earns a commission from each purchase. Founded in 2010 and not yet profitable, GoVoluntouring was acquired by global travel giant Flight Centre in 2012 for an undisclosed sum. According to Alexia Nestora, a Denver-based volunteer-travel-industry expert, partnering with a major player gives the startup the time and resources it needs to ramp up and break into the black. “The whole point of volunteer tourism is that you’re not going to save the world,” explains Nestora, “but it brings people into areas of the country that traditional tourists don’t go to.” With 70 per cent of GoVoluntouring’s inquiries already coming from outside of Canada, CEO and founder Aaron Smith hopes to position the Vancouver-based company as an industry leader in the next few years.